The bad boy pictured above was put together by a Mr. Daniel Eindhoven for €100 (that’s about $133). 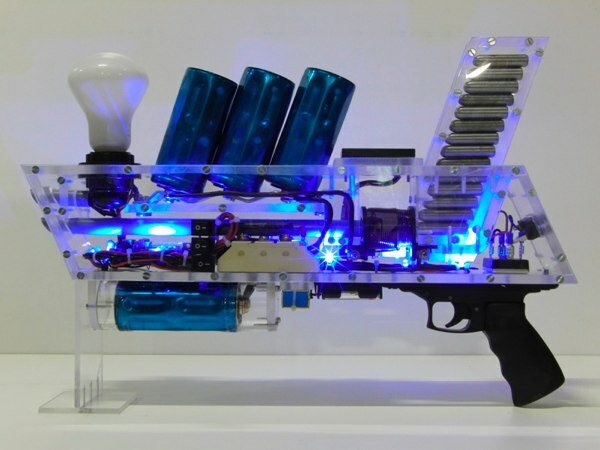 A semiautomatic single stage gun that boasts a 14 shot capacity, the weapon’s capable of firing a 42 gram projectile at speeds up to 110km/h, with a charge time of 8 seconds when plugged into mains power (or if you’re on the go, the internal batteries will light up in about 90 seconds). via DIY coilgun gives clever hobbyists the risk of permanent injury. This blog is under the protection of Chuck Norris.